When I arrived in Auburn, I left behind years of high school sports practices and awkward solo nights at my gym. I faced a new challenge now: my college lifestyle allowed me to workout when and how I wanted, but I was overwhelmed by the lack of structure. I worried that with my demanding class schedule, and without scheduled practices, I would overlook exercise completely. The fear of the freshman 15 set in. Lucky for me, I learned about the Group Fitness program at The Rec. I planted my fitness roots here and learned to expand my horizons when it came to exercise. Running in place on a treadmill is my definition of personal torture, so thanks to the diverse classes Group Fit offers, I break a sweat in other ways. I had never tried workouts outside my comfort zone, so I decided that college was the time to branch out. My favorites are Barre Essentials, Cycle classes, Butts & Guts, and for my ambitious side – 6 a.m. Yoga. All students already enjoy free access to The Rec. 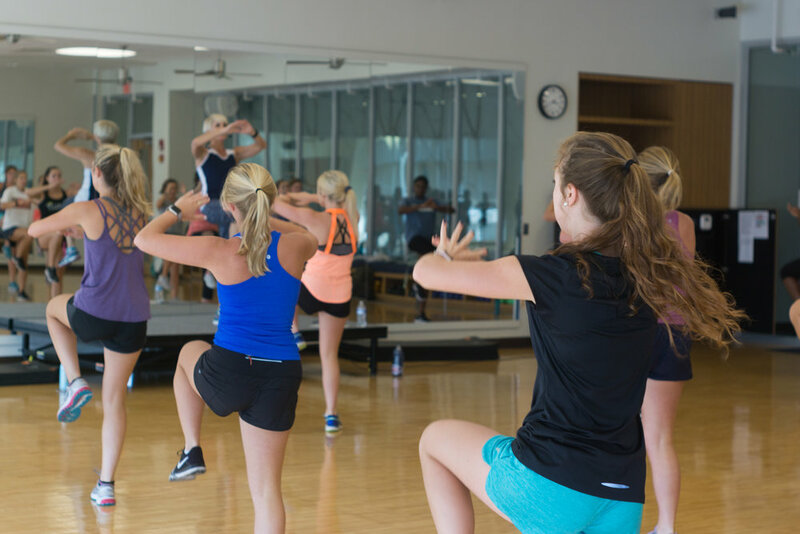 The group fitness program offers a semester-long class pass for $50. That’s right. The program includes over 100 classes each week during the semester. Compare that to your local specialized workout facilities such as Pure Barre studio ($150/month), cycle gym ($400/3 months), or yoga studio ($89/month). Plus, The Rec offers classes between 6 a.m.- 8 p.m., so you’re guaranteed to find some that fit into your schedule. My friends hold me accountable to showing up and pushing myself at each class we sign up for. Group Fitness allows me to work harder than I could on my own. I have learned that being sore for days after is an awesome feeling. In each class, the instructors provide different levels of intensity, so everyone is comfortable. Especially in yoga – we are reminded to focus on ourselves and be proud of just showing up. From seeing familiar faces in your class to the instructor remembering your name, the environment of Group Fitness at The Rec allows you to build connections with fellow students and staff. I am grateful for this program that holds me accountable and makes me feel even more welcome at The Rec. Katie is a junior studying Public Relations. Originally from Seattle, Washington, Katie has made Auburn her second home. Leaving behind gray skies and the bustling of suburban life, she has chosen the sunshine and a new adventure in the loveliest village on the Plains. When she is not in class you can find her glued to her planner scheduling every moment of her week, watching Fixer Upper marathons on HGTV, or wandering through the aisles of local antique shops. Katie believes that Auburn is a place where she can grow as an independent, a leader, and a lover of trying new things - including every Tasty recipe video on Facebook.